Wonderful location on the lake and easy 5 minute walk to the station. Great flat for our family of 4 - well equipped kitchen and so helpful to have a washing machine and dryer inside the apartment, two bathrooms with plenty of linen and towels provided, separate bedrooms for the kids. We used this as our base to visit family and travelled by train to supermarkets and nearby towns. Local restaurant Hirschen - amazing as always! Recommend this property particularly for families. Have a lot of thanks for the nice words and the several times you stood in our apartment. We are glad that you've had a wonderfull time and enjoyd your stay in Berlingen and with your family. We looking forward to welcome you again. 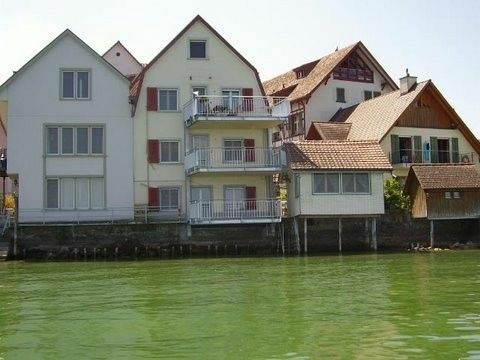 This is a spacious and well appointed flat with great views overlooking the Untersee (western end of Lake Constance). We were a family of five, but there was plenty of room with a large lounge and kitchen area. The utility room, with its washer and dryer, came in handy as we were in Switzerland for several weeks. There is a nice balcony where you can eat or relax and we watched the kids from there who swam in the lake every day. Some steps from the outside of the building give easy access to the clear and clean water. Berlinigen itself is quiet (which is just what we wanted), but there are number of lake side restaurants and a bakery and small supermarket in the village where you can stock up on groceries. Berlingen railway station is just 3 minutes walk away which has regular trains to Kreuzlingen/Konstanz and Schaffhausen. The jetty for the steamers, which go up and down the lake several times a day, is also a few minutes away so you can easily take a boat trip from there. We would certainly go back to this apartment. Die Wohnung ist super und praktisch ausgestattet, der grosse Balkon direkt über dem See, das Dorf idyllisch und ruhig. Ganz herzlichen Dank für die super Bewertung und wir freuen uns, dass Sie sich in berlingen uns in der Wohnung wohl gefühlt haben. Eine schönere Ferienwohnung ist kaum vorstellbar- die Lage direkt am See mit großen Balkon über dem See hat uns alle fasziniert- wir haben schon viele Urlaube am Bodensee verbracht, aber so schön haben wir noch nie gewohnt. Wir kommen bestimmt wieder. Es freut uns von ganzem Herzen, dass Sie sich in der Wohnung so wohl gefühlt haben. Es bestätigt unsere Maxime, die Ferienwohnung so einzurichten wie wir es uns selbst als Gäste wünschen würden. Es ist so schön, wahr zu sein! schweren Herzens und mit feuchten Augen! alles läuft und läuft und läuft. Schiff) bietet unendlich viele Reise- und andere Möglichkeiten. absolute Top-Wohnung mit sensationellem Ausblick und Balkon auf den Bodensee/Untersee. Top-Austattung, sehr schönes großes Wohn/Esszimmer mit Top-ausgestatteter offener Küche.